Hooray for snail! He brings the mail... but he’s ever so slow! A hilarious story fun to share aloud together, or for children to tackle on their own. 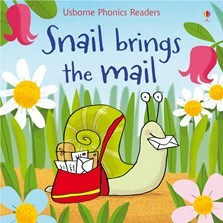 Reliable snail never fails to deliver the mail, but can he make it on time? With simple, rhyming text and phonic repetition specially designed to develop essential language and early reading skills. Also includes guidance notes for parents at the back of the book. This is a humorous tale which children will thoroughly enjoy whilst increasing their phonemic awareness... repetitive text increases the awareness of sounds and the rhythm makes the story flow.